UMF Tindastóll, a member of Iceland’s second tier league 1. Collin came to the Demize this summer with a goal in mind, build his resume over the summer by playing in the United Soccer Leagues to help take the next step in his playing career. After finishing the PDL season in July, Collin went to Iceland in search of a contract with first division side Tindastoll. This past week Collin recorded another game winning goal for Tindastoll and was named to the first divisions team of the week. Collin Helmrich a recent graduate of IPFW a division I college in Indiana came to the Demize this summer with a goal in mind. Build his resume over the summer by playing in the United Soccer Leagues that would help him take the next step in his playing career. Collin not only helped the Demize to victories over the Des Monies Menace, Colorado Foxes, KC Brass and Winnipeg but had five goals and three assists in 15 games played during the 2012 campaign. Two of those goals were game winners the most memorable against the KC Brass in a 2-1 victory. During his senior year at IPFW Collin was named to All-Summit League First Team. While starting in all 20 games for IPFW he recorded eight goals, 21 points and five assists ranking second in the Summit League in all three categories. 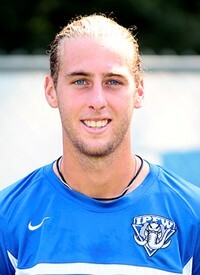 During his collegiate career Peter played for both the Springfield Demize PDL and PASL teams during the 2009 and 2010 seasons. Peter was also a part of the USL Combine in 2011 were the top 92 PDL players compete for the chance to showcase their skills to top professional teams both in the US and abroad. The former Drury soccer standout and Springfield Demize Player, Peter Higgins has signed to play professionally in his native Ireland. The 24-year-old Higgins, from Kilkenny, Ireland, has joined the Waterford United Football Club. Higgins was a midfielder for the Panthers from 2007-10 and was a three-time All-Great Lakes Valley Conference selection, including First Team honors as a junior and senior. HIggins started 68 of 69 games in his DU career, finishing with five goals (including four game-winners) and 11 assists. He was instrumental as a junior for a Panthers’ squad that finished 21-2, won the program’s first GLVC Championship and was ranked as high as No. 2 nationally in NCAA Division II.